Yellowstone is simply amazing, but it was not the right place for us to thoroughly enjoy. The campground was overpriced and a bit isolated, and the park so vast that we could not explore it, limited as we are by the lack of a tow vehicle. While we are willing to explore using the Big Kahuna if needed, it was just not practical given the crowds and lack of easy pull off parking along the main loops and roads. During the more than 50 mile ride through the park on the way to our campground, we had to creep through several congested areas where cars had crammed up the small shoulder areas to view bison, elk or other sights. I don’t want to take away from the park, it is amazing, but without a transportation system like they have in Grand Canyon or Zion, we could not see all that much. Even if we were willing to pay the prices for tours, some of the ones we were interested in would not pick us up at our campground. We stayed in the one reservable full hook up park within the park itself, Fishing Bridge Campground, and it was fine, but the price was steep; $54 per night after taxes. They are truly living off their location: the spots are cramped, right up against the neighbor to the rear, and the bathroom facilities are very old and dingy. They have a prison like feel, right down to the polished metal rather than glass mirrors. The showers were quite a distance from all but the nearest camp loops, further than in any place we have stayed, and seemed to be quite crowded, so we made do with our own shower. One bit of advice I would give to anyone planning to camp or RV in Yellowstone is avoid buying anything in the town of West Yellowstone, it is exorbitantly expensive. If you forget to stock up before getting there, then just wait until you are in the park itself and use one of the stores there, we were amazed to see that their prices were less than the town just outside the park, especially for liquor and beer, though selection was limited. 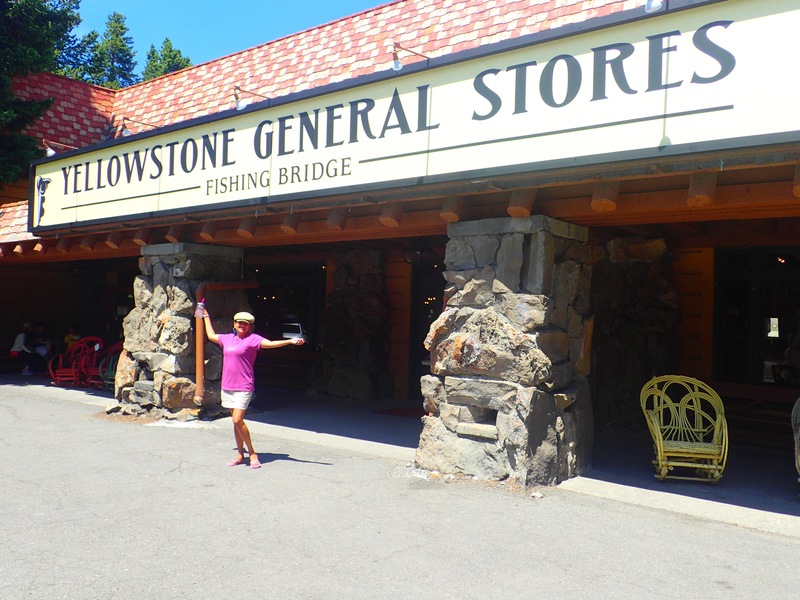 Avoid buying anything in West Yellowstone, just outside the west entrance. Use the little stores in the park itself if you must restock. How disappointing that you didn’t get to really see much of the park. Grand Canyon and Yosemite have great shuttle systems — why doesn’t Yellowstone? The traffic gets really bad, especially on a Saturday, just like it does in the other parks. Our tow car was *key* for exploring Yellowstone! At least you saw elk and bison! The biggest thrill for us were bears and moose and even an albino elk — of which we spotted from our car. We have to agree with you on many of your remarks about the park. We loved the park but we were there in late April and had made the comment that we would not like to be there during the summer months. Also we do not have a tow vehicle and as you said it is hard to try and stop at some of the trailheads as there just isn’t parking for a motorhome much less several of them. I think the reason that they don’t have a transportation system, is that the park is just so huge. We didn’t stay in the park, we just couldn’t justify the price. We only had two days to spend in the park so we stayed outside of it the first night then spent the day driving a couple of the different roads and then drove through to Gardiner and stayed at a National Forest campsite just outside of town and then the next day we went back in and spent about half the day there before continuing on our way. We would definitely love to go back there and see more of the park, it really is fantastic. Yes, one of the more disappointing campgrounds. We are finding that the contracted full hook up campgrounds within national parks seem to be pretty shaky in that way, just as the one in Big Bend NP was.